Even though I had some photos which suited this week’s theme, they just didn’t seem to have a thread to draw them together – other than one of us reading the newspaper. I had decided I would pass on this theme, when a related sub-theme came to mind. It just didn’t occur to me until this morning that the event in question would commence its 25th anniversary tomorrow. 1988 was Australia’s Bicentennial year, celebrating 200 years of white settlement and Australia as it’s come to be today. From an Indigenous point of view it was certainly contentious and perhaps was also a turning point in the debate about the impact of settlement and colonisation on the country’s indigenous peoples. 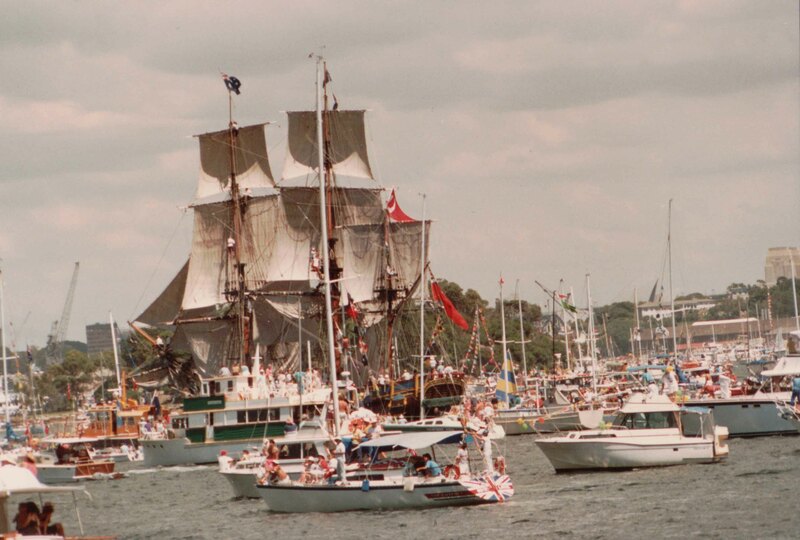 Overall it was a year full of events and celebrations for those so inclined, starting with the arrival of the Tall Ships. On Australia Day the huge display of Tall Ships, sailing boats and large navy vessels cheek-by-jowl in Sydney Harbour was thrilling and the day culminated in one of Sydney’s iconic fireworks display. 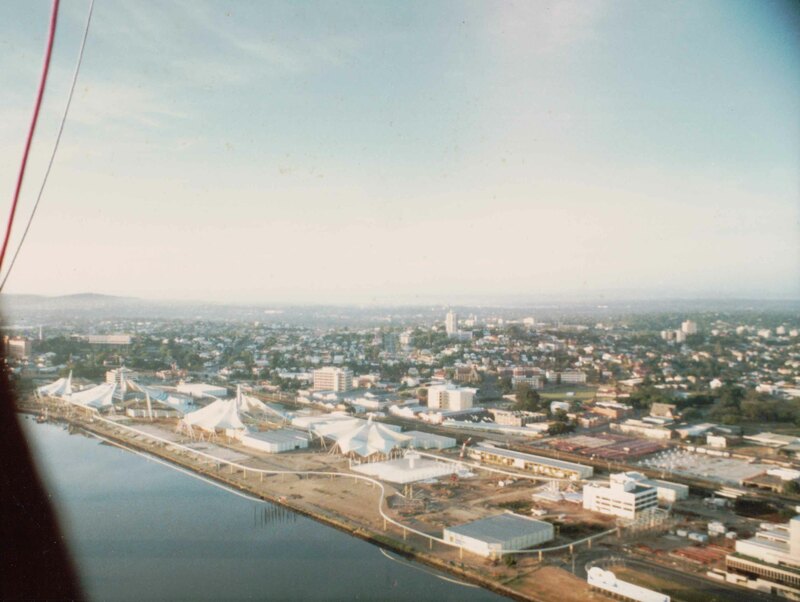 A view of the Expo site from a hot air balloon, early 1987. 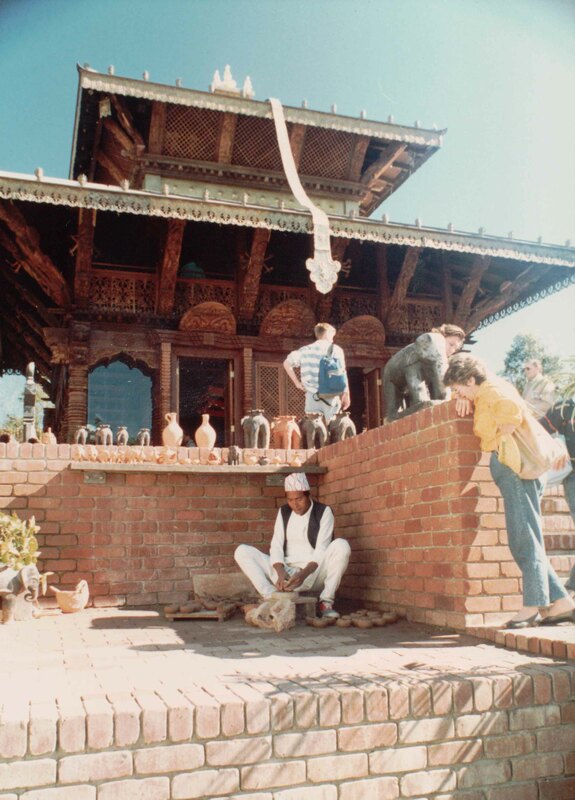 In Brisbane, the event of the year was World Expo 1988. Starting on 30th April, early autumn, it last an exciting, interesting, and fun six months. Brisbane turned on its best winter weather full of sunshine and clear blue skies and the westerly winds didn’t turn up too soon. I remember that we’d planned only to get a multiple-entry pass for financial reasons given we had school fees etc to take care of. Then someone (who??) talked me into the merits of a full season pass. It was a fantastic decision because it meant we could come and go as we pleased, for as long or as short a time as we liked. Opening Day of Expo was a crush and a buzz of happiness. Expo was held on the south bank of the Brisbane River, clearing a huge area, and most unfortunately displacing many of the poorer people who lived in the area. It had been the dry dock area and I recall that my great aunt lived there with her son, for a while after a stroke. And here’s the link ! A statue “reads” the newspaper at Expo. 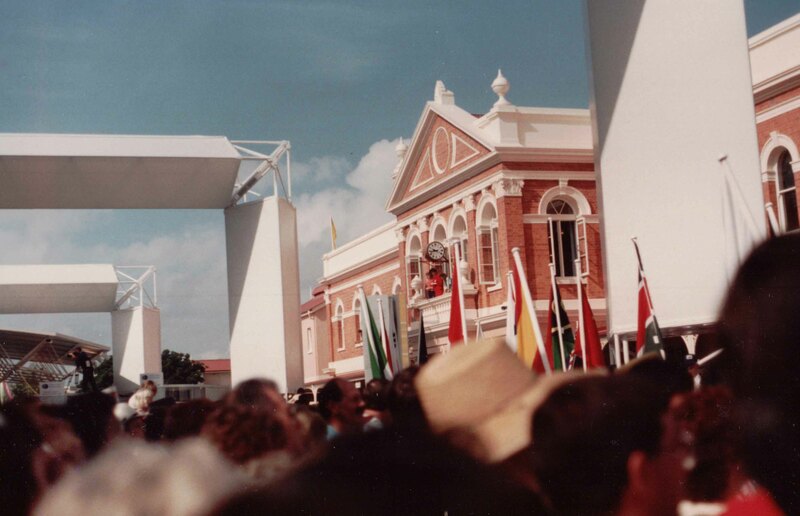 The morning Expo 88 opened the crowds were packed densely at the gates, but full of anticipation. There was a surge of excitement when the gates opened, but It really didn’t matter when you went, there was always so much going on and so much to see. The Canadian and New Zealand pavilions rapidly became high-demand venues, so if you walked past and there was no queue you didn’t miss a chance. We loved the Nepalese pavilion, now preserved in the South Bank Parklands. 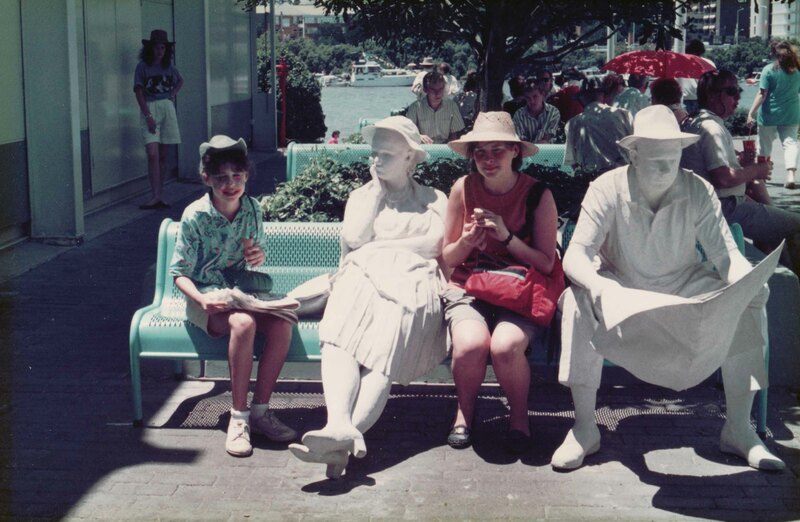 Everywhere there were fun statues in poses which suited their location (many have been resited around Brisbane). Taking family photos near them became everyone’s hobby. 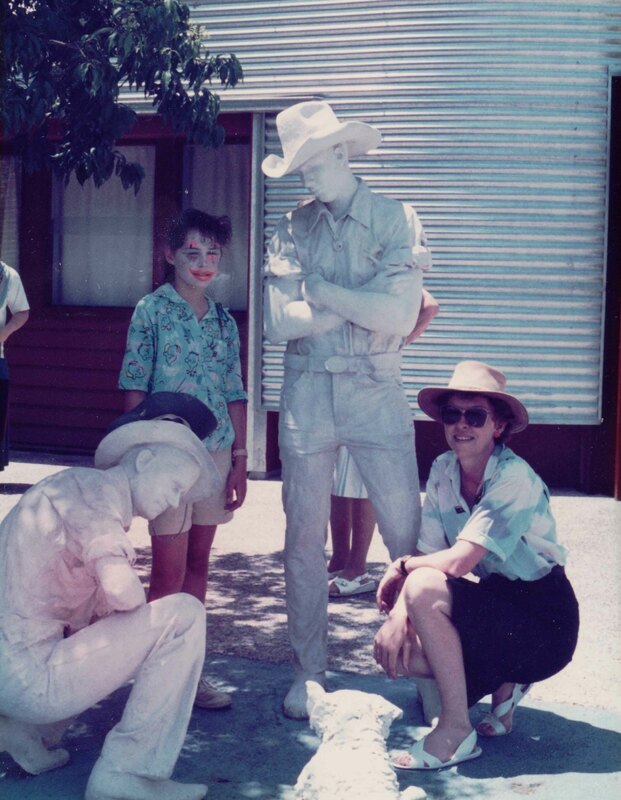 I had to include this one of Mr Cassmob’s parents with the statues-great newspaper reader themselves and her hat echoes that of the woman’s. Mr Cassmob’s aunt, moi, and DD2 and 3 outside the Oz pavilion. There were concerts at the river which attracted huge crowds, and parades in the streets. Our older two then-teenaged daughters would sometimes go on their own to meet friends on a weekend after school or their part-time work. It was great because you knew they were safe. There were street performers to entertain, footpath artists and a wondrous array of objects, even an original copy of the Magna Carta, to enjoy in the pavilions. Brisbane had never seen the like before. Even if our daughters had missed out on our travel gene (unlikely! ), this certainly ensured that foreign lands captured their imaginations. Youngest daughter and I would often visit on the earlier evenings of the week while Mr Cassmob was studying, then he and I would have a date night later in the week. The Nepalese pavilion had delicious sweets and samosas if I remember correctly. Each of the countries represented had their own food stall and there was such variety to choose from. Unfortunately I didn’t get to enjoy this so much because it coincided with a fun period on a rigorous food elimination diet: potatoes and beans anyone? One of the events at Expo was the Irish release of the Australian-Irish convict register on computer. On it I discovered information for my expat friend in the USA who was also researching Gavins but not my mob. There really was something for everyone with so much entertainment and new experiences. It became a great place to catch up with friends and family and I was so pleased that we stretched the budget to a full pass for each of us. It was a great investment and we surely got our money’s worth. We were there on opening day and it was such fun as our eyes popped with all the new sights and experiences. We were there on closing day and it was so sad: no surprise that youngest daughter had her face painted with tears. In the words of the Seekers’ song “The Carnival is Over”. 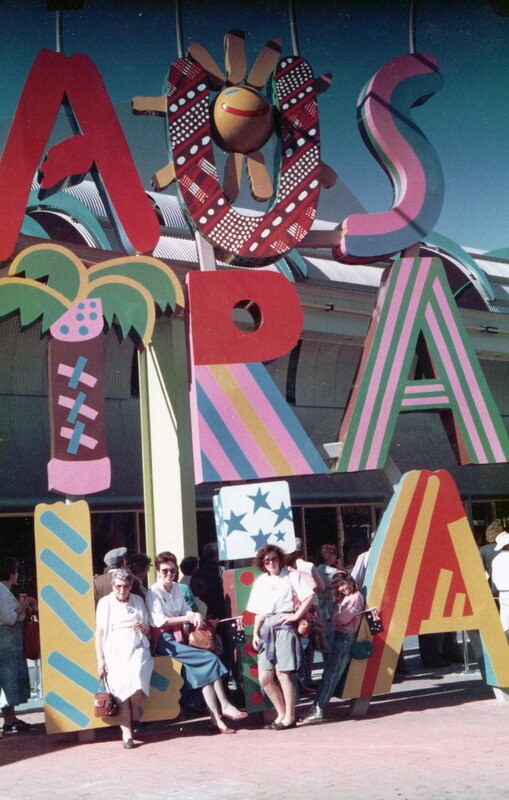 Expo 88 had been a six month festival that had captured hearts and changed Brisbane forever. There was much public debate as to how the site should be used and eventually it became a public parkland with a large pool. Adjoining the Brisbane Performing Arts and close to the Art Gallery, Museum and State Library it adds a different dimension to the city. This entry was posted in Brisbane, Cass family history, Family History, Queensland, Sepia Saturday and tagged Bicentenary, Sepia Saturday, World Expo 88 by cassmob. Bookmark the permalink. EXPO certainly was a great time to be in Brisbane… I was lucky enough to be working in media at that time, and of course, everyone suddenly needed to do business in Brisbane. I spent a great deal of time at EXPO, mainly at the Australian and Queensland pavilions, entertaining clients and getting to meet all manner of people, including international guests.There were few places I didn’t see, some many times… I also spent so much time on the Kookaburra Queens that one was known as my office… A fabulous party, and the atmosphere around town was wonderful… Brisbane did us proud. I’ve been in Birsbane on business but never had a chance to look around. Perhaps next time I’ll get a chance to visit the park and former site of World Expo 88. What a shame gluepot! That’s the problem with work, it keeps getting in the way 😉 Hope you get to enjoy the River City one day. 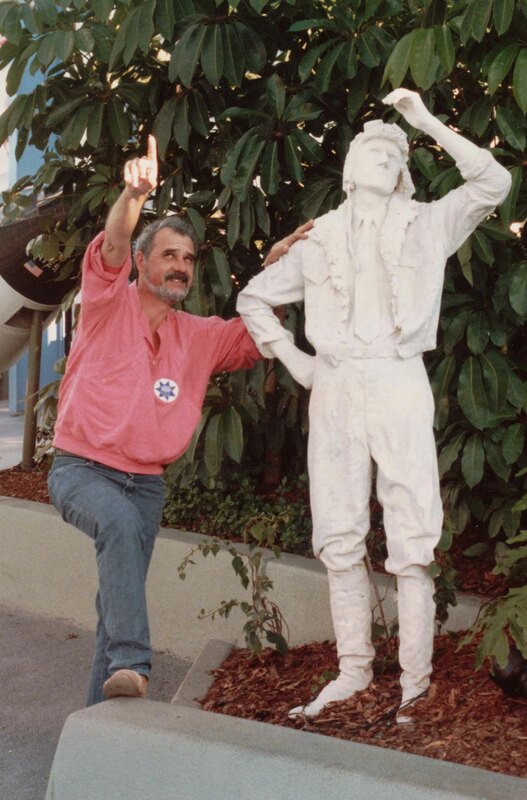 It looks like Mr. Cassmob’s father is reading over the statues shoulder. He was a big newspaper fan Kristin which is partly why I included this photo despite the wash-out on the statues. Now that’s a clever link to the theme. I wonder how many photographs there are in existence of people sharing the statue’s newspaper! Oh I think it would be in the thousands if not tens of thousands Little Nell. A perfect fit to the theme with a clever spin. 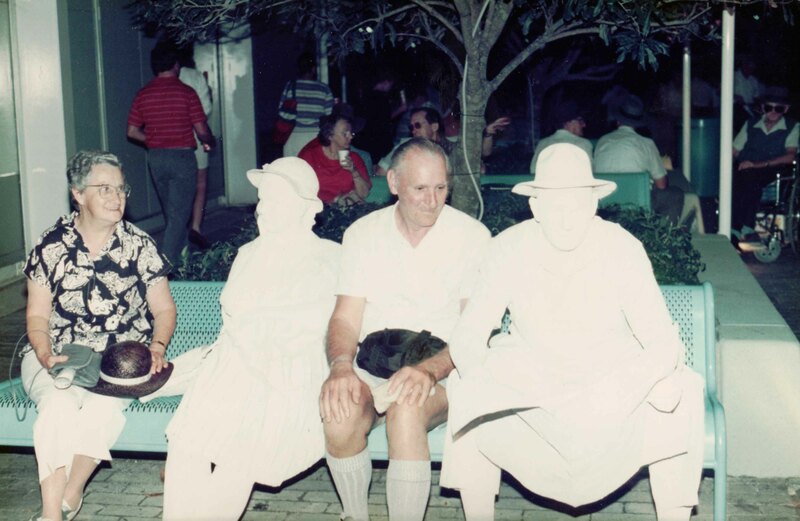 The statues make for a strange ghostly effect like a double exposure. Thanks Mike, yes it is a bit spooky, especially given the real people are now deceased. I liked the way you picked up from the theme and told me something new, with great memories and photographs. .
A fine collections of memories and photographs. Just right. The statues on the benches provide a wonderful setting for picture-taking.